Ahhh...my computer problems are behind me. I'm (almost) certain of it. I'm typing this ordinary Mantel Monday post on a shiny new laptop. The Apple guy told me it was a Ferrari compared to my old MacBook Pro. But, he was trying to sell me a computer. So, it might just be a Buick. Either way, I'm happy. Let's shelf the new computer talk for a minute and talk about this mantel. The green flowers from last week are still kicking (well, at least they were when I photographed this mantel on Saturday. I'll be honest, they're not looking so perky today), so I decided to recycle them this week. I mixed in some tarnished silver, shiny bronze and old books (my go-to for adding height) and called this mantel done. Yes, my silver needs polishing. No, I'm not going to polish it. Not this week. Maybe not next week. The week after that? We'll see. 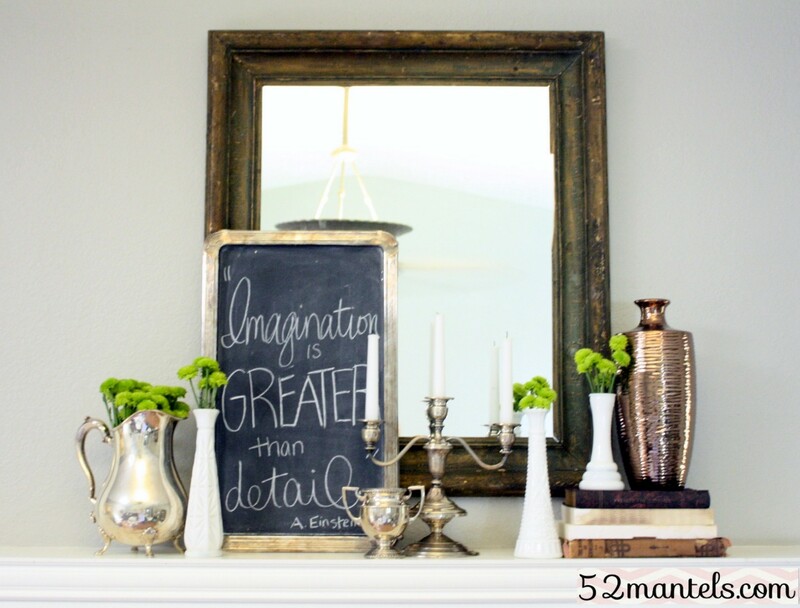 My silver tray-turned-chalkboard says: Imagination is greater than detail. That Einstein fella is pretty smart. Did I mention I got a new computer?? I had to get a new laptop, too. I settled for a cheap one with the thought that I can get some additional technology as well. Like an iPhone. 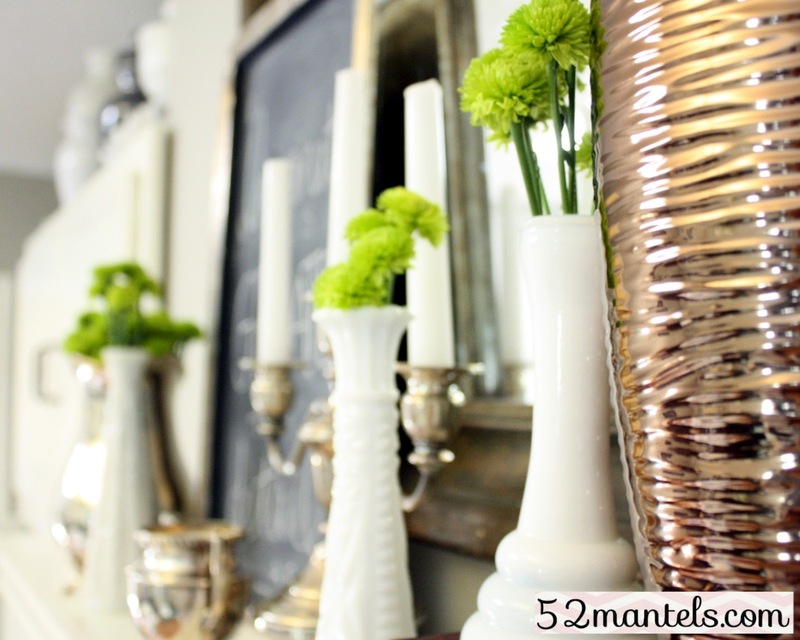 I love the mantle. Congrats on the computer! I need one too but it will be a while before that happens. So for now I deal with the unexpected when it comes to my computer. 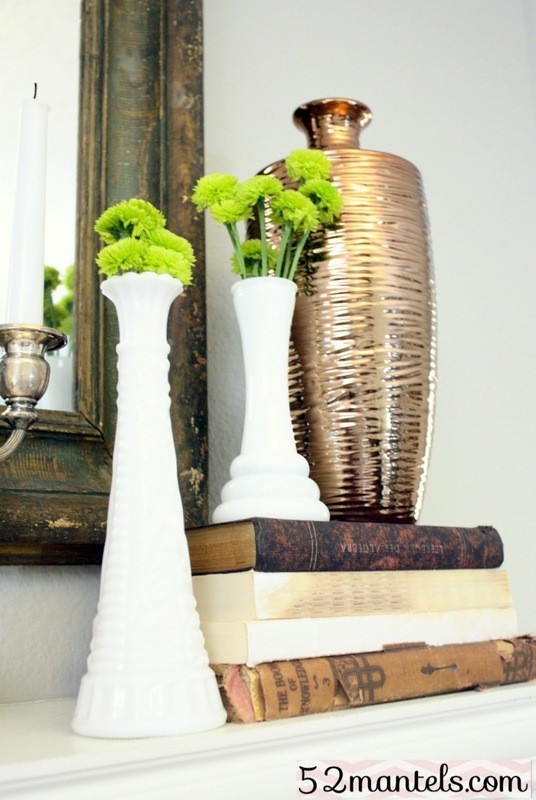 Some of my favorite things - tarnished silver, chalkboards, old books & milk glass! Oh, and that super creative title! So excited that you got a new computer! My MacBook is six years old and starting to act up -- my husband wants to get me a new one, but I'm just not ready to part with this one yet! But I know it'll feel great when I do. 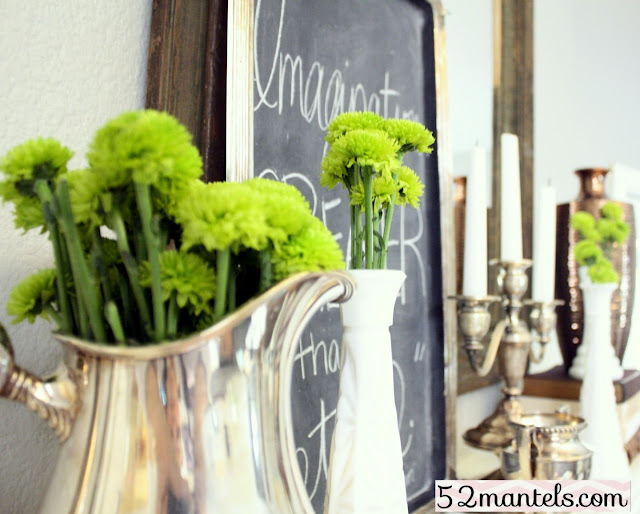 I love this week's mantel! The silver is such a pretty element. This totally reminds me of something my mother-in-law would do in her home! Well done! Nice work as always Emily! I seriously love your blog.....it has been an inspiration to me for a while now! And thank you SO much for the very sweet comments on my blog!! I am so happy your computer problems are fixed! Ugghh what a pain! :o) I love the look, I love all of your mantles! I SO need a mantle at my new place!!! New follower, here! So, for the craft-virgins out there, do you have a tutorial for the tray/chalkboard sign?